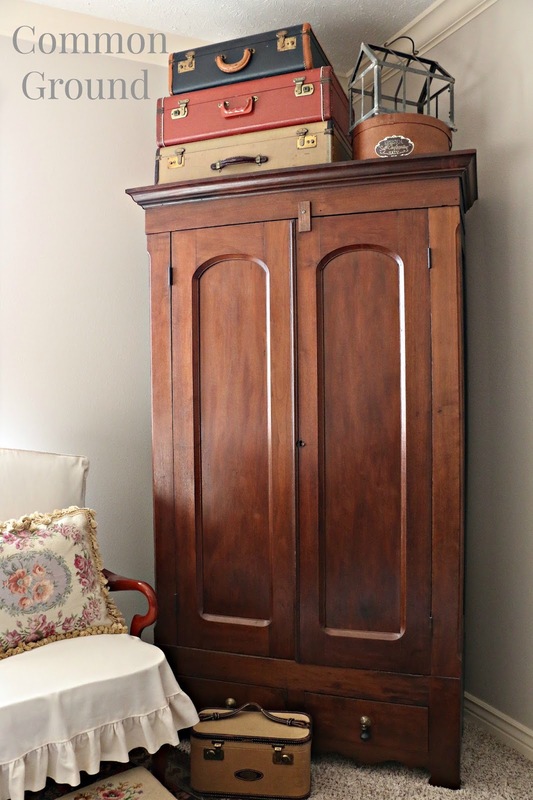 The post I shared last week about the Kilim rug really started out to be about this armoire. You remember it? 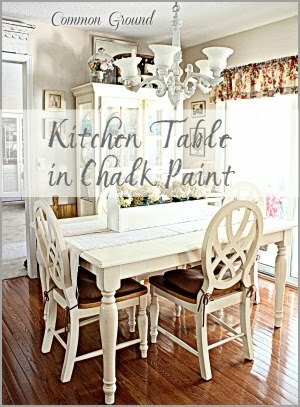 I had it in the kitchen sitting area at the lease house as a pantry/cupboard. Before that it was in the lower level family room as a quilt and pillow cupboard. Now it's morphed into a TV cabinet for the Master Bedroom. 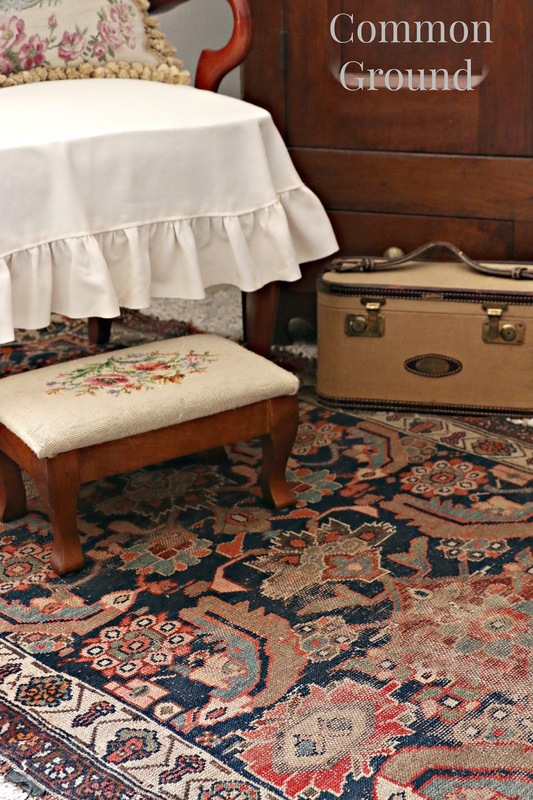 I added the little Kilim rug to give the space a little interest and "oomph". After I dug the rug out of the boxes in the garage, I knew I just had to give it a little spotlight. 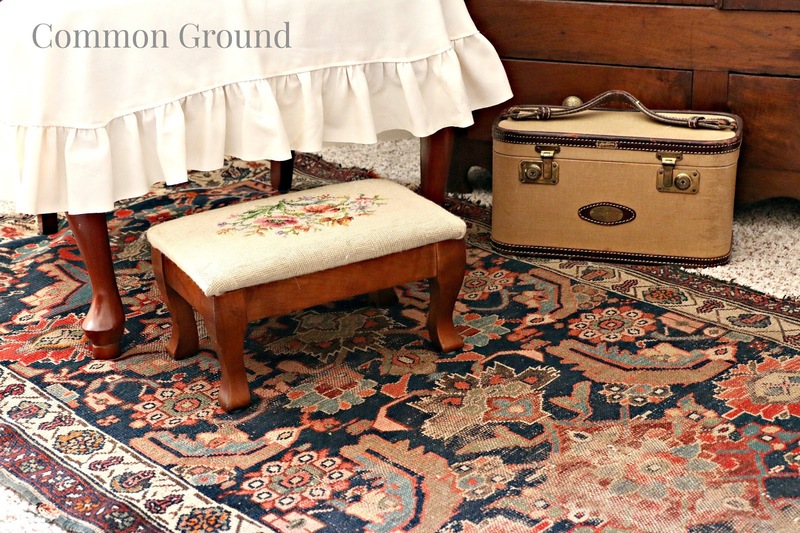 I hunted for antique rugs this last week in St. Louis, but I didn't get a chance to visit our antique shop where we've purchased others, so I'll have to wait a bit to find it some companions. I'd like to layer them in Hubb's "reading room" since it's a masculine cozy space. Here it is in the kitchen last year. to phone books and linens. that had been by the fireplace at our previous home. 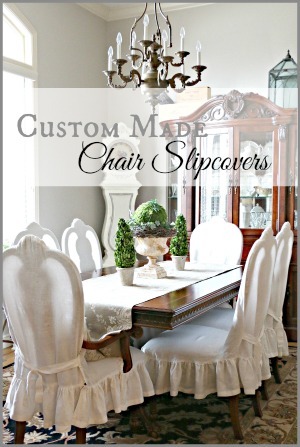 I had made chairslips for this one and her "sister" several years ago. 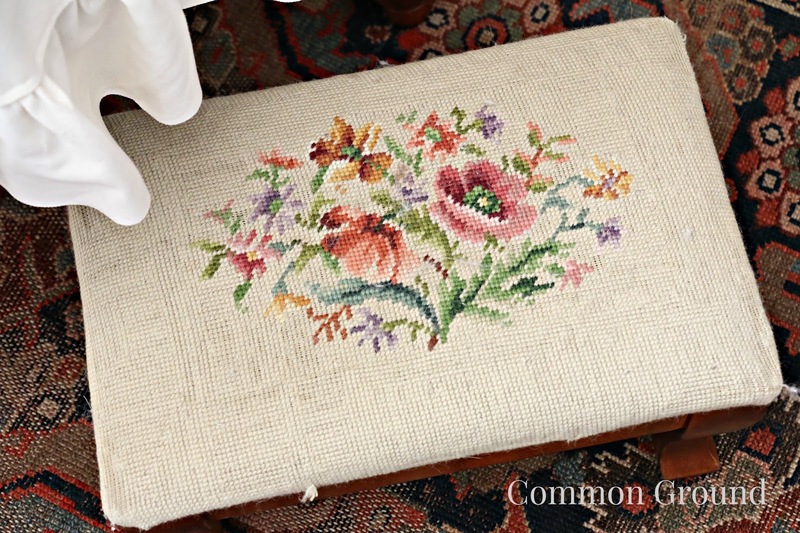 One of my little embroidered footstools and a "linen" traincase are here too. 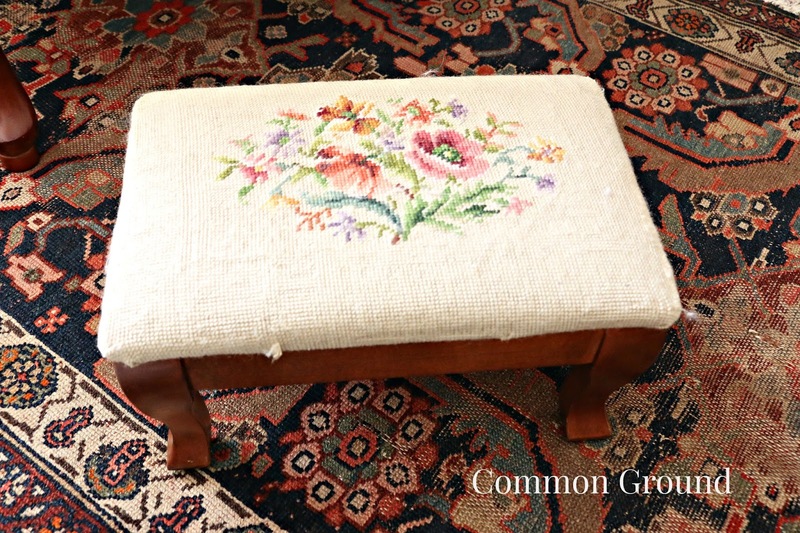 I have several of these little footstools, enough to say "a collection". They're spread throughout the house. I need to do a post on them. Since I'm short I grab one for a stepstool at times. I think there's room for another one or two up here. I just have one print in here, and as you can see the curtains aren't hung yet either. We worked in the basement storage going through boxes marked "Prints"...all two dozen of them. We finally wore out, and just brought a few upstairs to hang. It was late and I wanted to hang my prints for the kitchen before anything else. So this room is taking awhile. As you can see, I'm starting to get a little behind in the decorating. It's been too cold to do much work at the storage units or the garage. Once it gets warm I hope to make up for some lost time. Hope you all are having a good week, and if you're on the East Coast, stay warm and safe! I adore your armoire. I love the vintage suitcases and cosmetic case. I had a couple of stools like that for a while. It all looks so cute. I can't wait to see more. 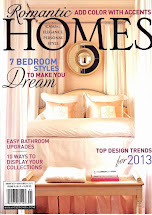 I loooove that armoire Debra. How gorgeous is this piece. 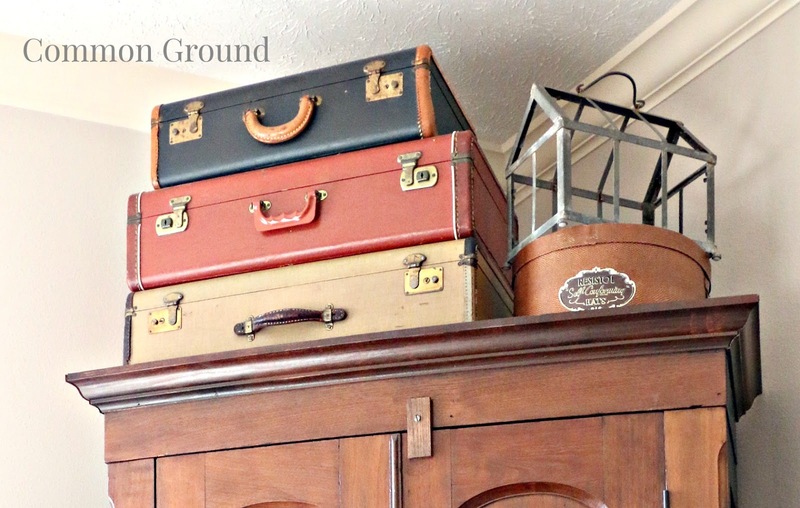 It looks great with your vintage suitcases. Love your stools too. So sweet. Have a great week. 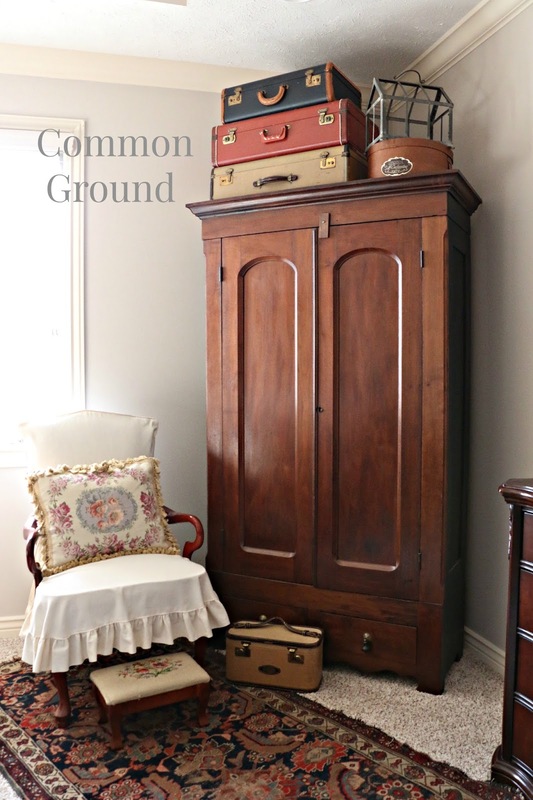 Still lovin' that beautiful armoire and I see you have a navy vintage suitcase too. 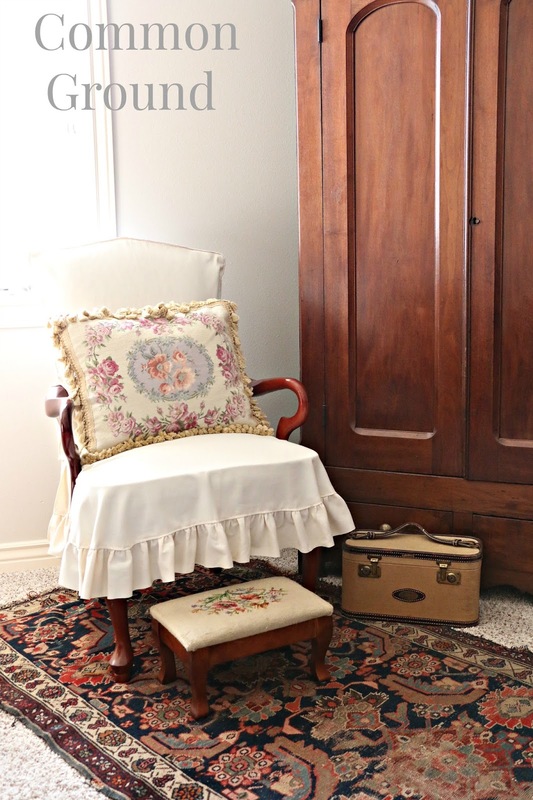 I love the line suite case on the floor and your chair looks so pretty...the whole area does! Love everything about this corner, Debra. 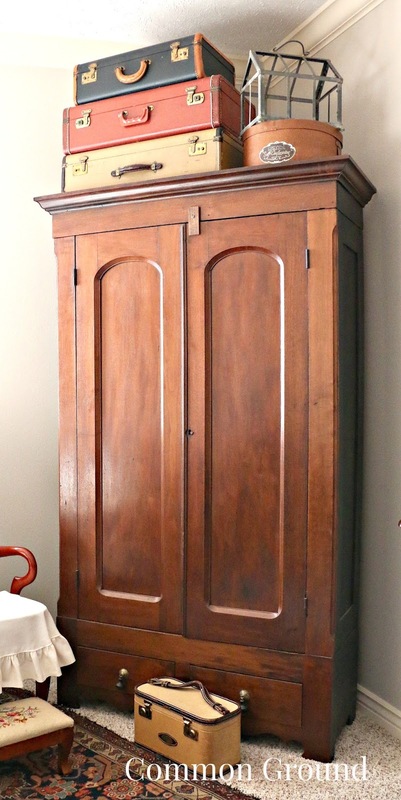 I have a similar armoire that I have extra clothes stored in, but would love to empty it and have a central place for quilts & pillows. I used upholstery tacks and hung several of my beaded purses on its side. I seemed to gravitate to those little footstools, too, and use them at almost every chair I still upon. 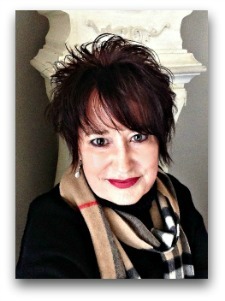 Love your armoire, Debra!! 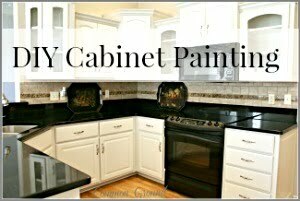 When we got married, the Mister refinished an armoire for our first house. It has survived six moves and is serving its purpose in our sunroom today. Love your step stools too! I am "height challenged" as well and always have to rest my feet on something. Enjoy your day! That is such a pretty piece and looks fabulous anywhere. Love it in the bedroom. 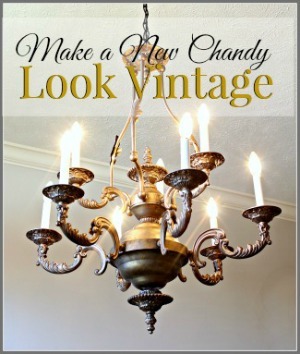 It's such a beautiful piece of furniture that it looks wonderful wherever you put it over time. Love this latest pretty corner arrangement! Such a cozy looking nook. Beautiful. This corner is cozy perfection! I love the old suitcases. It's gorgeous! DON'T PAINT IT!!!! LOL! That armoire is such a gorgeous piece. I love the suitcases stacked on top! 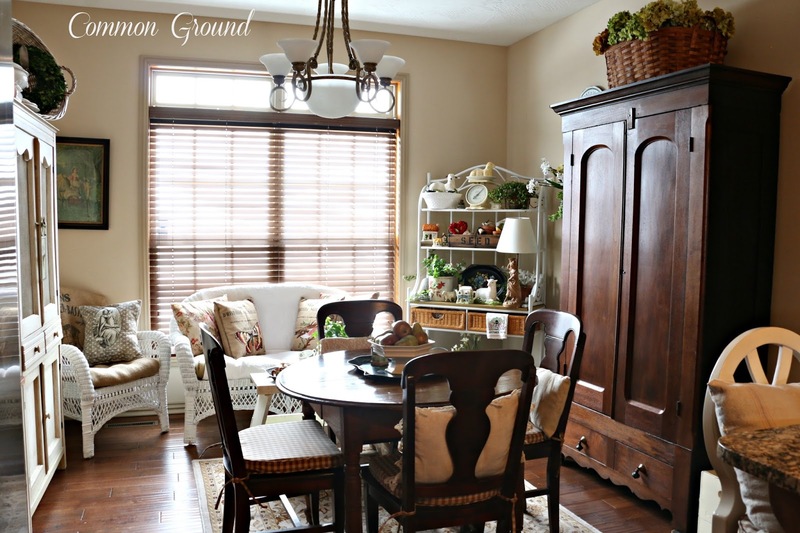 BEAUTIFUL armoire Debra...love the look of that whole corner!! Love your beautiful workhorse - you styled it with a gentlemanly flair. 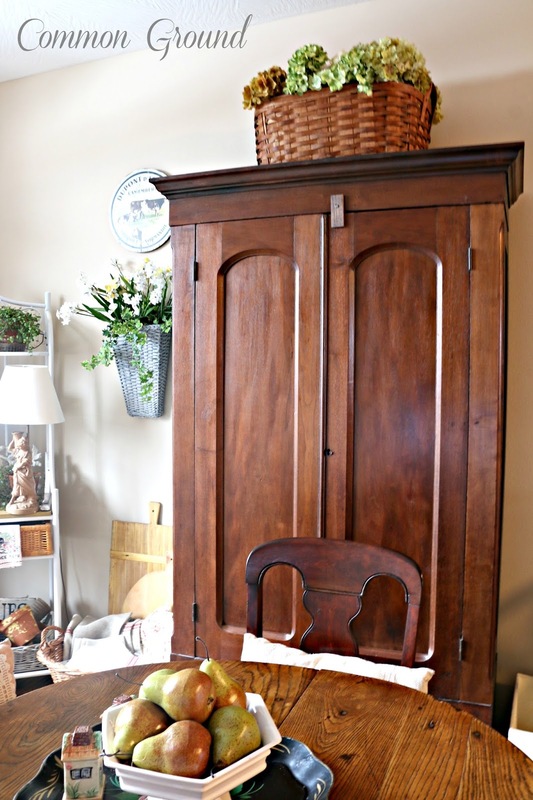 Debra, this armoire is a gorgeous piece and so universal It literally would work in any room. Love how you have staged it. The suitcase stack on top as well as the linen one below are great and I love the little footstool. Thanks for sharing with SYC. 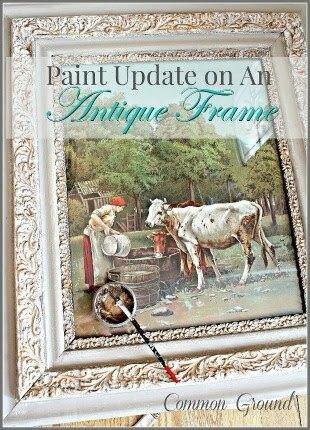 Your armoire is gorgeous Debra and I love all your pretty vintage treasures. 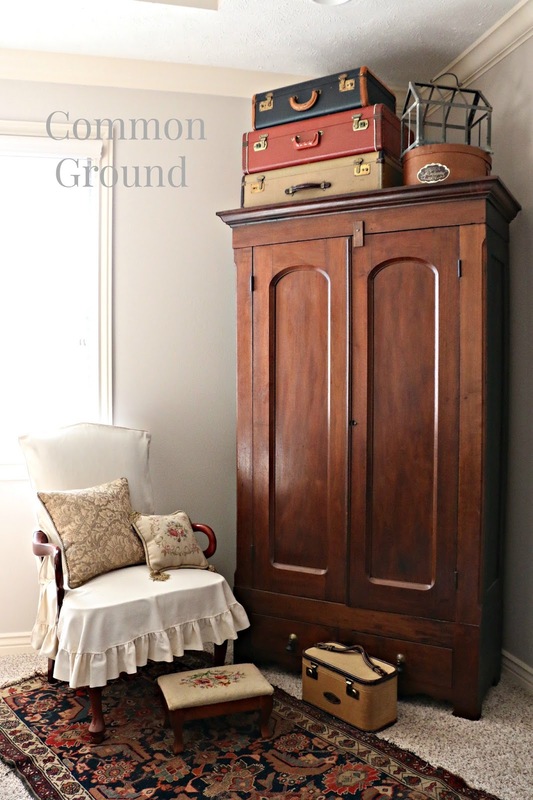 Your armoire is not only a lovely piece, but a versatile one, as well!!! 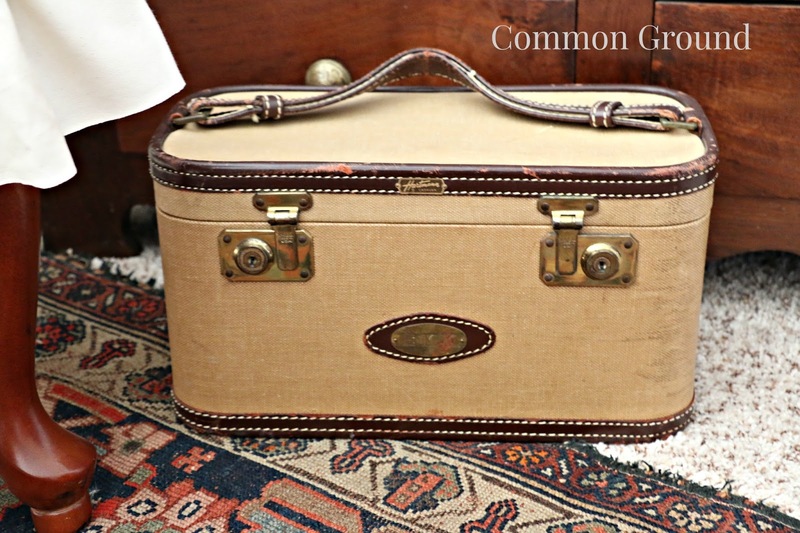 I'm swooning over the linen train case, dear friend!!! to Union Station in Kansas City to catch the train for California!!! 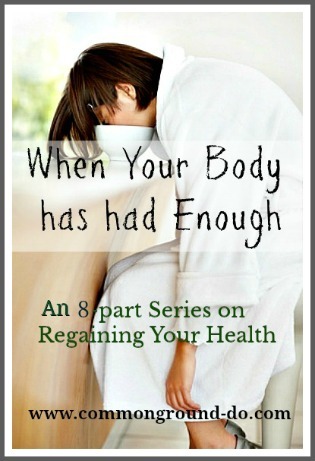 Pace yourself. . .Spring is an amazing time for freshening and reveals!! !